Product #55623 | SKU BSV401AU2M | 0.0 (no ratings yet) Thanks for your rating! Voltage fluctuations, surges and spikes can damage and degrade the overall performance of your computer and peripherals. 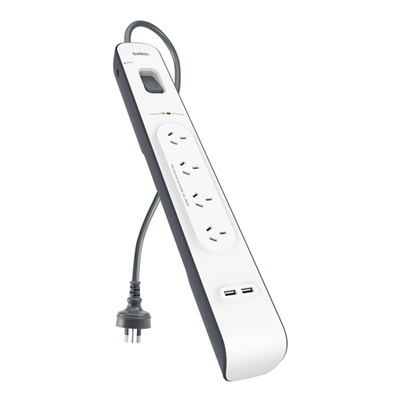 The Belkin 4 Outlet Surge Strip with 2.4A USB Charging, BSV401AU2M offers extra outlets, power extension from wall outlets and protects valuable electronics from damaging power surges. This power surge protector safeguards your personal computer, printer, hard drives, modems and other hard-to-replace equipment against damage, data loss, file corruption, and system crashes.